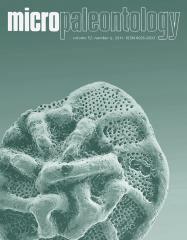 ABSTRACT: Well preserved pleuridia attributed to the problematic group known as melanosclerites have been discovered in Upper Ordovician greenish-grey silty shales of the Shiala Formation of the Tethyan Garhwal Himalaya of India. This material is attributed to genus Melanosteus, which has also been reported from Ordovician and Silurian erratic boulders of the Baltic region, as well in Devonian Upper GaspÃ© Limestones from the GaspÃ© Peninsula, Canada. The new species Melanosteus indica comes from below the Ordovician-Silurian boundary as established by acritarchs from the same section.